The local carrot yields in Kenya can be doubled. This can be done by using saline-tolerant carrot varieties and a simple groundwater management system. Using water management measures can also reduce the amount of irrigation water used by 20% to 40%. This became evident from a trial project that Delphy, Saline Farming, and Nectaerra ran in Kenya from September 2018. 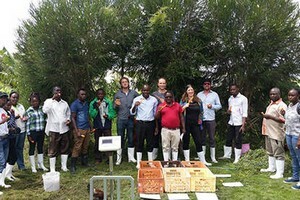 With this project, these Dutch companies are offering a solution to the negative agricultural processes that are used, especially in Africa. These lead to land degradation such as soil erosion, salinization, and loss of biodiversity. In the long run, this then leads to a decline in crop yields. 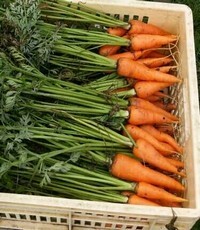 During the first phase, a local carrot variety and two saline-tolerant varieties were sown. This was done in September by two Kenyan farmers who are plagued by salt water and saline soil. Midway through December, the initial results of these harvests were received. These results look very promising. The volume of the saline-tolerant carrots was twice as high as that of the local variety. “It is crucial with a project such as this to get the input of a local crop advisor. 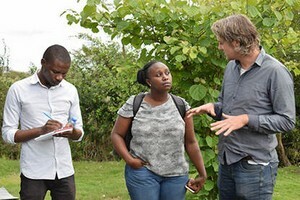 He can talk to local farmers and knows how they think and work", says Eric van Zandwijk, International Project Manager at Delphy. Delphy is a consulting firm. “It helps, of course, that the first trial produced such a good harvest." In the next phase, the parties involved want to develop tools. These tools can help the Kenyan farmers transform their businesses into resilient, 'smart' climate farms. These farms can then be used for commercial vegetable production. Water management will be structured, and trees will be planted. Van Zandwijk says, "In the first instance, it will be about physical measures such as digging trenches and laying water buffers. The farmers will have to learn how to use saline-tolerant crops in order to use their water in a smart way. We want to begin to support one or two farmers in this. Here, again, the local advisor will play an important part." The problem remains in getting financing for this phase. Per farm, the transformation will cost between €30.000 and €35.000. The Dutch participants want the local farmers to get loans for this. However, they cannot find a local lender. “We do not want to bring 'free' money to Kenya. The project must be set up in a real commercial way", explains Van Zandwijk. “The amount needed is too high for micro-financing. On the other hand, it is too low for large lending firms. We are still trying to find a solution for this." The third phase of the project consists of planting trees. Research has been done in different parts of the world. The results of these studies show that so-called agroforestry (AF) intercropping-systems make more effective use of sunlight, land, water, and nutrients. Crops cultivated there have fewer diseases and pests. "In addition, trees absorb CO2. You then get a healthy soil at your doorstep. However, this process takes five to six years. You, therefore, have to have patience", explains Van Zandwijk. The parties involved will shortly submit a SBIR (Small Business Innovation Research) application to the Dutch Enterprise Agency, RVO.nl. This will be for support for phase 2. They hope to be able to start this second phase with one or two local Kenyan farmers. This should happen in the course of this year. Once a couple of farms have been transformed, they will serve as example projects for other local, interested farmers.